Have a custom app you want us to build? Contact us for a free quote! 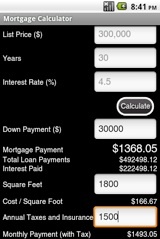 Simple mortgage calculator with optional cost per square foot and property tax calculations. 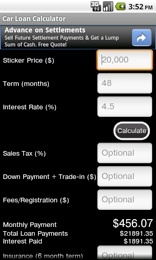 Easy, simple car loan calculator, including optional inputs for sales tax and insurance. Calculate monthly cost of ownership. The basic math is the same, so use as an automobile loan calculator, motorcycle loan calculator, ATV loan calculator, boat loan calculator. 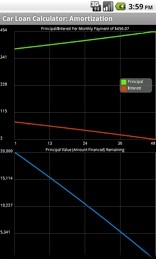 The easiest, most accurate car payment calculator on the market.